Beets are one of those vegetables that I never used to cook because I didn’t know how to prepare them to make them tasty and interesting. Then one evening while having dinner out in celebration of my husband’s birthday, our waiter described the chef’s special salad of the day. It consisted of roasted beets on baby greens with goat cheese. It sounded interesting, but neither one of us was willing to venture out and order a whole one, so we compromised and ordered one, which we shared. BIG MISTAKE! We were racing each other in our efforts to have the largest portion. Right then and there I knew I had to find a way to replicate that salad. I experimented with several ways to roast the beets, one being to wrap an unpeeled beet ( or beets) in foil, drizzled with a little olive oil, and bake for about an hour. Then cool slightly, peel, and proceed with your recipe. I am not fond of this method, because it adds to the time spent preparing the dish. I prefer the following method of preparation instead. Peel about 4 medium beets and cut each in half. Then cut into 1/2 inch wedges. Drizzle with 1 tablespoon olive oil. I like to use a seasoned/flavored olive oil, like one used for dipping bread. Season with salt, pepper, and a little garlic powder. Toss all together so beets are lightly coated. 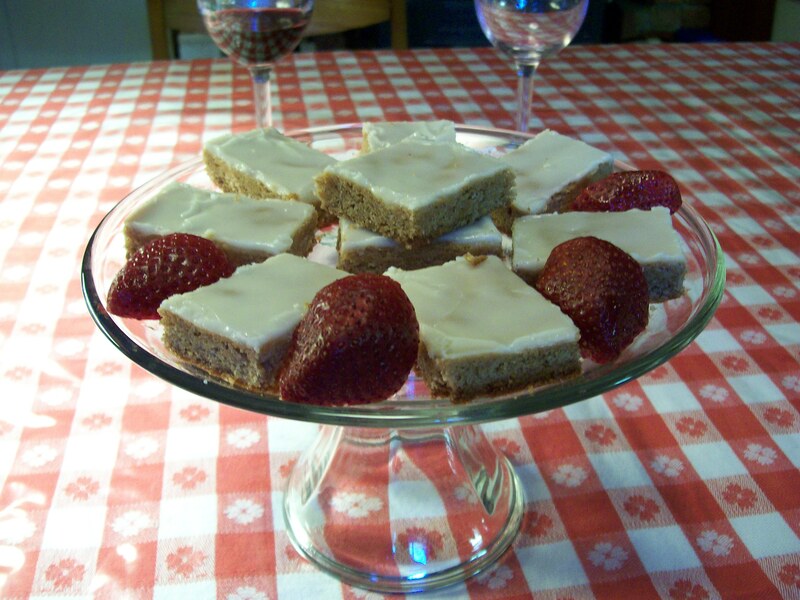 then spread in a single layer on a baking sheet or shallow baking dish, coated with no-stick cooking spray. Roast at 450 degrees, stirring once or twice, until crisp tender, about 35 minutes. 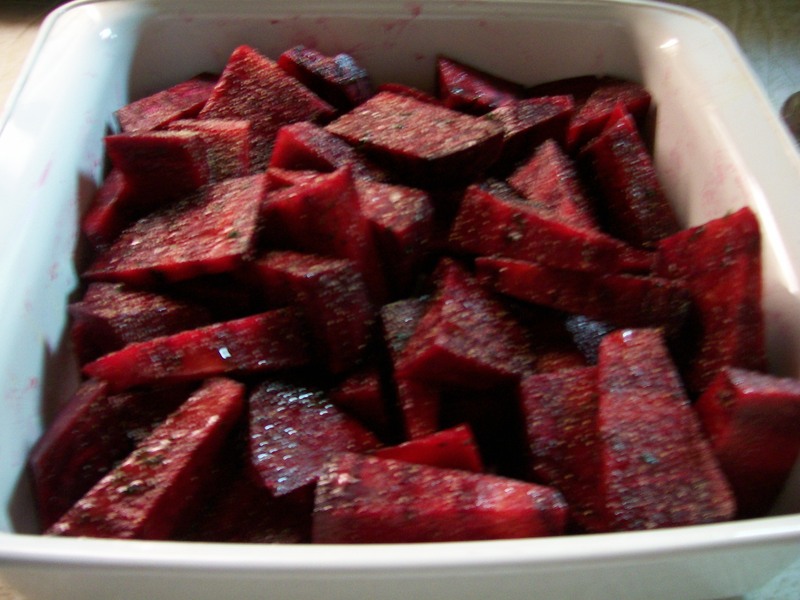 At this point you could serve these beets hot as a side dish, and they are delicious as is: lightly browned on the edges, and already seasoned; or use them in the salad. Once cooled, transfer to a bowl; toss with 4 chopped scallions and 2 teaspoons lemon juice. To assemble the salad, place a serving of mixed baby greens on each of 4 – 6 serving plates. 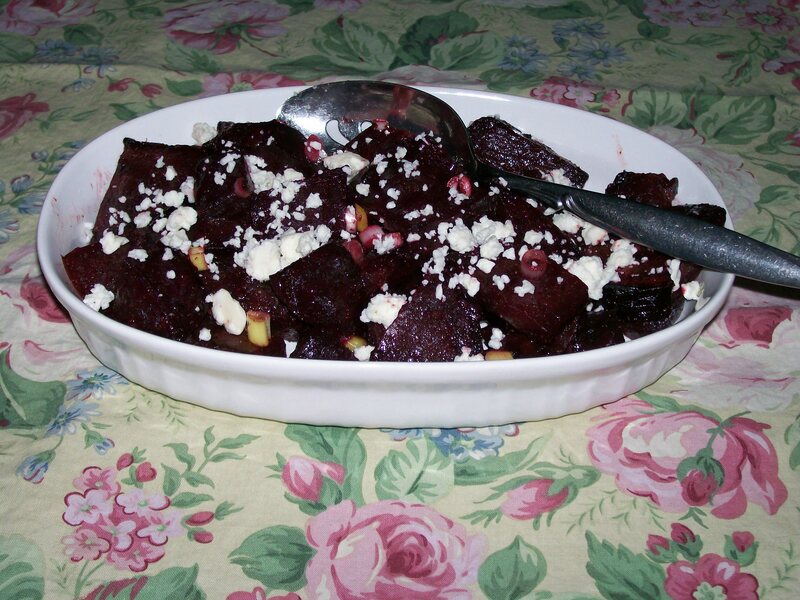 Drizzle with a little of the seasoned olive oil used to season the beets, then top with the beets, and lastly top with crumbled goat cheese. Feta cheese is also a good substitute for the goat cheese. Tomorrow being Cinco de Mayo I thought you might enjoy this colorful and tasty recipe. In case you were wondering what to have for dinner there’s still plenty of time to prepare a festive meal in honor of this Mexican holiday, with ingredients you probably already have in your kitchen. Rinse the chicken pieces. and pat dry with paper towels. In a 10-inch skillet cook the chicken in hot cooking oil, uncovered, over medium heat for about 10 minutes or until chicken is light brown, turning occasionally so chicken browns evenly. Drain off the fat. Pour the salsa over the chicken in the skillet. Reduce the heat; cover and simmer for 35-40 minutes or until chicken is tender enough to be easily pierced with a fork. Transfer the chicken and salsa sauce to a serving platter. Sprinkle with the cheese. Serve with the tortilla chips tucked in among the chicken pieces for a nice presentation. I like to serve this dish with Spanish Rice, guacamole, and additional tortilla chips on the side. Source: This clipping has been mounted in my recipe notebook for many years. I do not remember where it came from. Having made these bars several times over the past few months, I can vouch for their popularity, and delicious combination of flavors. 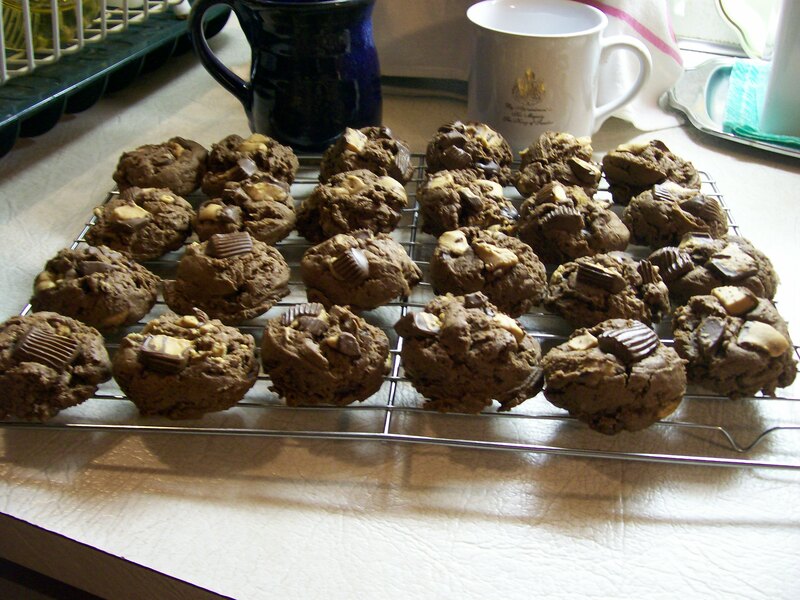 They have become my go-to recipe for when I or my husband need to contribute something to a pot-luck event. We always get asked for the recipe. Try them—and they just might become your new favorite bar cookie, too. 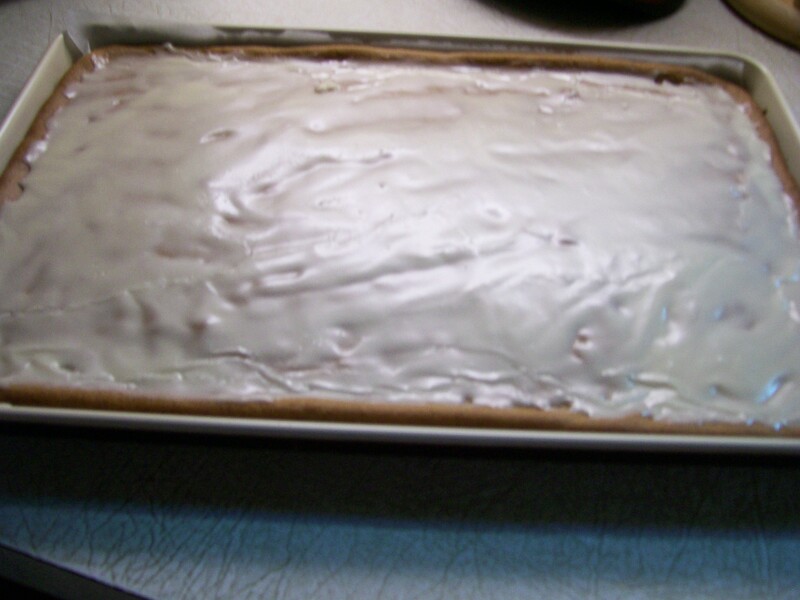 Preheat the oven to 350 degrees and lightly grease a 10” x 15” jelly roll pan. 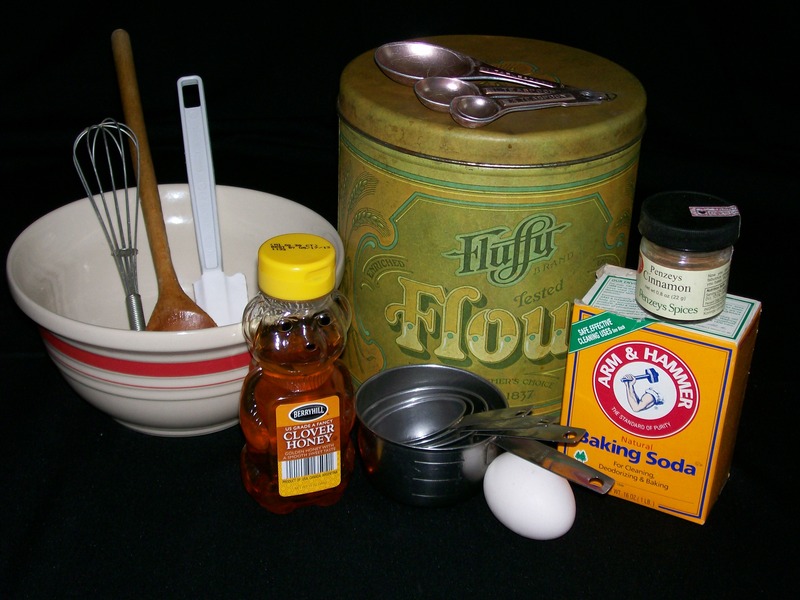 Whisk the flour, baking soda, salt, and cinnamon together in a bowl and set aside. With an electric mixer, combine the oil, honey, sugar, and egg until well blended. Add the dry ingredients and mix until they’re incorporated. 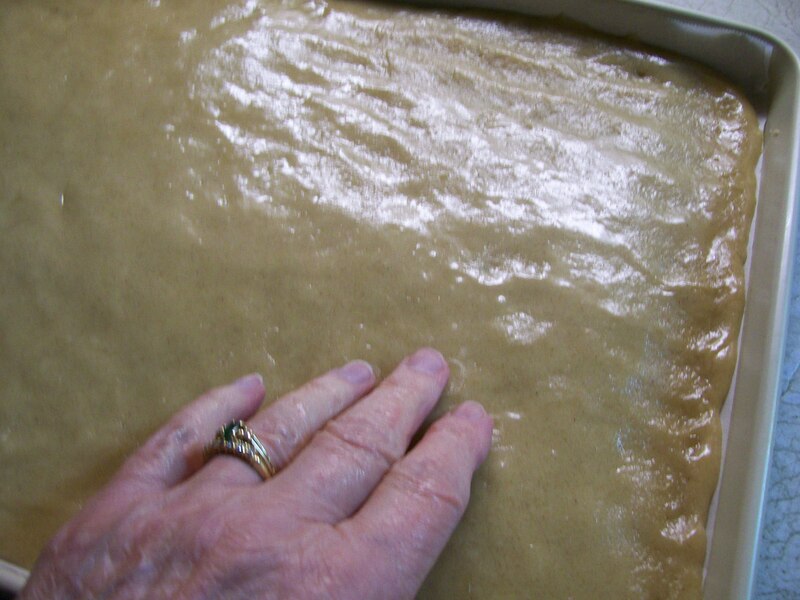 Press the dough evenly into the prepared pan (grease your hand first, then pat the dough into place). 5. Bake for 16-18 minutes, until the top of the center looks dry. The bars will puff up, then fall a bit when they come out of the oven; this is how they should be. 6. While the bars are baking, make the glaze. Mix all the glaze ingredients together. When the bars come out of the oven pour the glaze over the top and spread evenly. An off-set spatula or pastry brush will help with this. A note here: Yes, the glaze really does contain mayonnaise, and nothing else will do to get that unique flavor. If you must use a vegan version, canola, soyannaise, or Miracle Whip will do, but do not leave it out, and substitute something else. Cool for 15-20 minutes before cutting into squares. ( 6 rows down by 9 rows across). You can trim the outer 1/2” all the way around the pan to get a more uniform result. Yield; 54 squares plus trimmings.